Who doesn’t love a good grilled cheese sandwich recipe? Annnnnd, a good leftover turkey sandwich? What a marriage of the two – BOOM…sucker punch to the ol’ tastebuds! This one really stands out. Even though the mozzarella is tremendously good, the star for me cheese-wise is the goat cheese. It adds such a delicious flavour to this grilled cheese sandwich. Turkey has got to be at the tippity top of my fave proteins and I love having leftovers whenever we roast one. Sometimes the recipes using leftover turkey are better than the original. I mean, turkey soup, cold turkey with Dijon mustard (SO good) and turkey sandwiches, like this epic turkey cranberry sandwich. 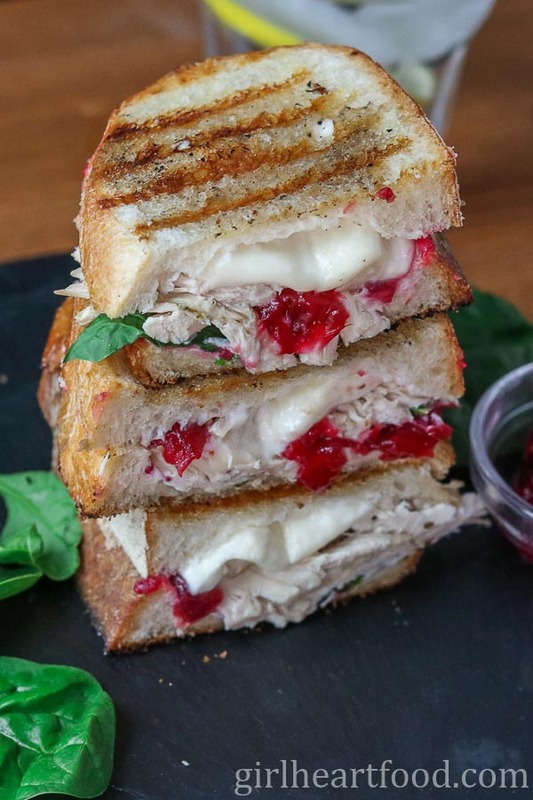 You can certainly use canned cranberry sauce in this turkey cranberry sandwich. You know that wobbly, jelly can-o-goodness? It slurps out in one big blob. Yeah, that. Some people love that stuff, others not so much. I happen to enjoy it (yes, certain old school classics will always hold a place in my heart…nostalgia and all), but this time I made an easy cranberry sauce that literally took minutes to make. How did I make it? Then, add 1/4 cup or more (depending on how sweet you like it). Note—>I don’t like things too sweet so you may want to add more. You do you! Stir, bring to a low simmer, and cook for about 10-15 minutes until mixture has thickened (stir every couple of minutes so it doesn’t burn/stick). You can have this as ‘clumpy’ or as smooth as you like. I like to leave a little texture in mine. If you want your mozzarella a little more ‘melty’ you can place the sandwich in the oven after grilling for a few minutes on 300 F.
Use whatever bread is your fave. For this sandwich, I used sourdough. 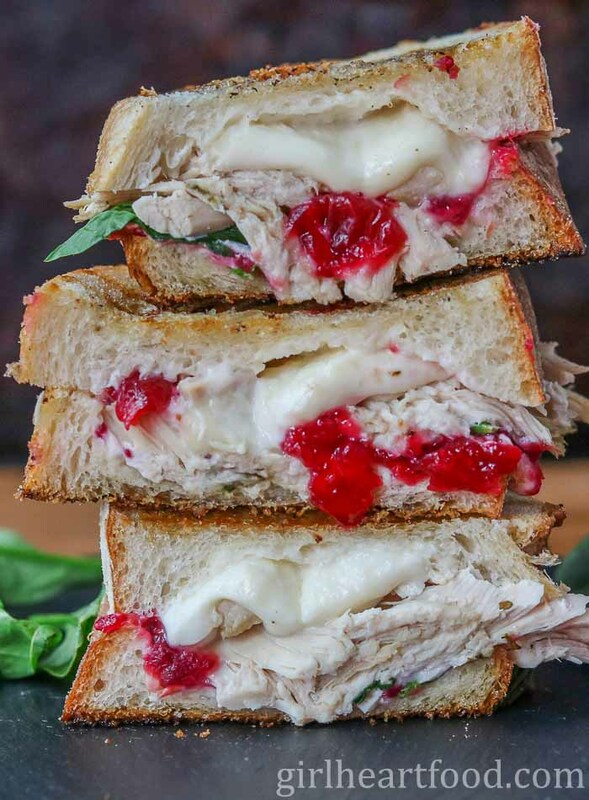 Hope you love this turkey cranberry sandwich! How do you like to enjoy leftover turkey? Do tell! Spread mayo evenly on 4 slices of bread. On top of 2 of the slices top mayo with goat cheese. Spread cranberry sauce on top of those 2 slices and sprinkle with black pepper. Top cranberry sauce with a few leaves of baby spinach. Top spinach with turkey and then mozzarella. Then, top with mayo bread slice. Butter exterior of bread slices and grill in griddle pan (or non stick pan) on medium heat for 3-4 minutes per side until golden brown and cheese melted. Enjoy! I just made these! (With Brie not mozzarella) and it was so good!! 😍 loved it!! Yay!!! So happy to hear that, Sarah 🙂 Thanks so much for trying! alllll the good things in one sandwich! leftover sandwiches are one of my favourite parts of the holiday season! is that wrong ha ha? I can’t wait for turkey leftovers to make this! I like the cranberry sauce out of the can, but I think this would be so good with the fresh made kind! We always end up with multiple types of cranberry leftovers after Thanksgiving, so I will be making this often! Haha – Dawn, food always comes up in my conversations too – it is the universal binder -right? BTW, you are quickly becoming the sandwich queen in my eyes! This is so darn pretty – so love those pops of red! Almost too pretty to eat – almost! Happy to hear it ;)I think this sandwich would be great any time, if you ask me! Thanks so much, David! This is one of my favorite taste combinations to put on a sandwich (turkey and cranberry) and I always forget about it until I see it again! I love the idea of adding mozzarella cheese also! Thank you for the wonderful inspiration! I love your blog! 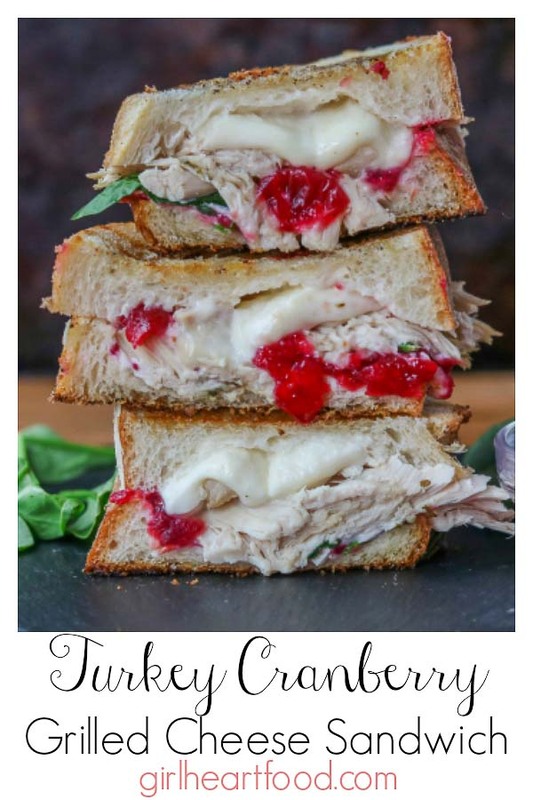 Turkey and cranberry is one of my favourite sandwiches, especially this time of year! (Hello, Thanksgiving is in a week!!) I love that you added mozzarella! Looks so cheesy and filling! Hope you’re having a great week Dawn! Oh boy! This is my kind of sammy! I’m not certain I will be able to wait until Thanksgiving for leftovers to make this grilled cheese. I might need to find a way to make it much sooner! My goodness, this is awesome! I still remember that blueberry sandwich, and now you shared this outrageous deliciousness. You’re so cruel to us, Dawn! 🙂 Indeed, it’s a great idea, and I was going to use the similar idea in a different way after Thanksgiving. Hopefully there would be enough turkey leftovers. Wow! This post really makes me wish it was November. But I need to be patient. Such a beautiful sandwich. Great bread, and I love the two cheeses as well! Dawn – this is awesome, one of my all-time favorites and you’ve elevated it to gorgeous! I think I need to go buy a turkey! Thanks for the inspiration, pinning! Very timely, for I know that we will be facing heaps of leftover turkey breast very soon! And of course love all the cheese and that cranberry tangy goodness. May make an entire platter of mini turkey grilled cheeses and have a party for Black Friday haters, lol! Of those people we know many, all good beer loving people:) Pinned! This looks so good! I’m so craving turkey and cranberry sauce now! Thank you Kelly! Right 😉 ?! Two kinds of cheese PLUS all the fillings? This is epic, Dawn! I feel like people should serve this for Thanksgiving instead of the whole turkey–the sandwich is much more exciting :). Have a great week, girlie! You’re bringin’ it with the grilled cheese sandwiches lately Dawn! 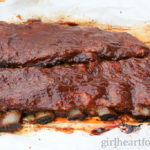 And this one will be perfect when we’ve got all the leftover turkey at Tgiving too! Thanks to your sister in law for her input on this one! I’ll be trying this delicious combo for sure!